Life on the land surface of the earth is impossible without the presence of water. Even simply organized, early prokaryotic organisms need to keep their cytoplasm hydrated for metabolic activity. The ability of early photosynthetic organisms to survive desiccation was one of the most important achievements for terrestrial life outside water. Desiccation tolerance must have evolved at least two times independently, first, in the prokaryotic algae (=cyanobacteria, Chap. 2) and, second, in the newly evolved eukaryotic algal lineages originating from either primary (green and red algae) or secondary endosymbiosis (brown algae). 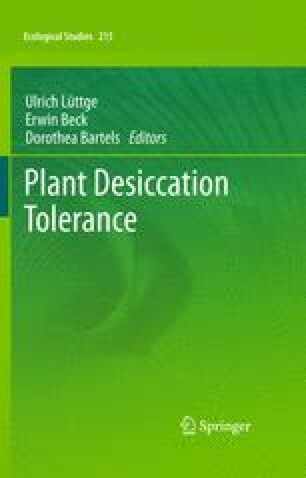 Desiccation-tolerant algae are found among the three major groups of the green land plants (Chlorobionta), the Chlorophyta, the Prasionophyta, and the Charophyta. Other desiccation-tolerant algae are found in the red algae (Rhodophyta) and the polyphyletic group of algae with heterokont flagellae, including the brown algae (Phaeophyceae). I would like to thank the editors for the invitation to contribute to that highly interesting volume of Ecological Studies. Parts of this work have been supported by the German Research Foundation (DFG).